The designs in the ikat fabric are the result of using narrow pieces of plastic or banana fiber to bind groups of weft thread which when dyed will resist the color. Here the tying frame holds enough weft thread to weave a skirt or “phasin” about 3.7 yards. 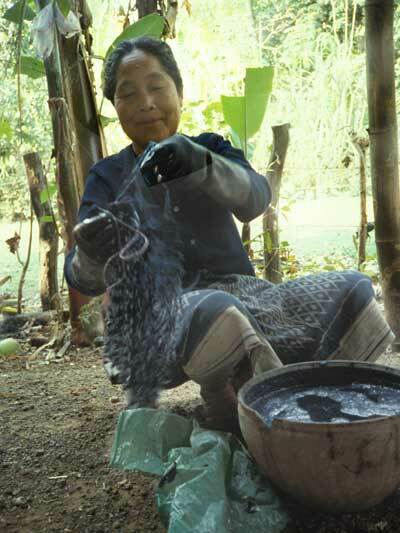 After completion of the tying, the threads go into the dye bath. Complex patterns involve adding more resists to preserve a hue, then overdyeing to create multiple colors.